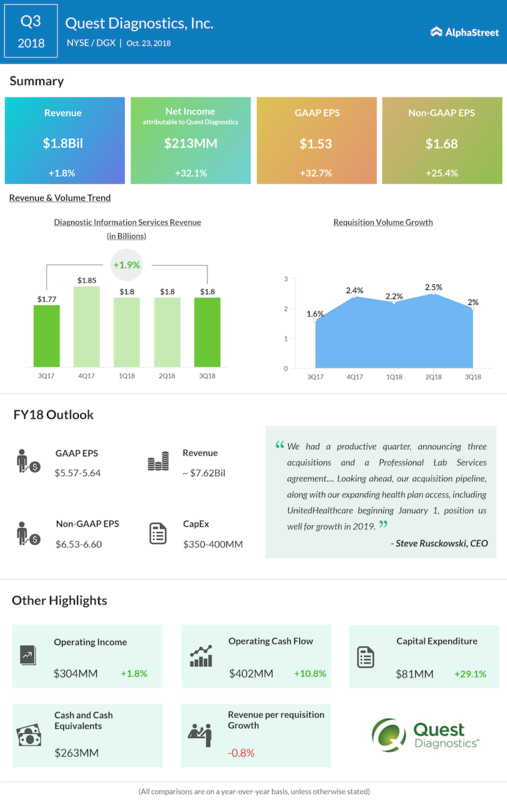 Quest Diagnostics (DGX) has been pursuing strategic buyouts to tackle the slowdown in revenue growth in recent quarters, marked by weakness in prescription drug monitoring. Earning of the clinical laboratory is expected to drop about 1% year-on-year to $1.36 per share when it reports results for the fourth quarter Thursday before the market opens. The estimate for revenue is $1.88 billion, down 2.7%. In each of the three tailing quarters, earnings matched analysts’ forecast, and the trend is likely to continue in the fourth quarter. The company’s stock, which currently carries a sell rating, usually shows high volatility depending on the earnings outcome. In the third quarter, the Secaucus, New Jersey-based firm posted in-line earnings of $1.53 per share on revenues of $1.88 billion, which came in above analysts’ forecast. It is estimated that fourth-quarter results will benefit from the acquisitions of PhenoPath and ReproSource, which were closed last year. In addition, the initiative to incorporate blockchain technology into hospital health systems to improve data quality and cut costs, in partnership with other leading health care organizations, will have a positive effect on the top-line performance. Quest’s impressive acquisition pipeline, with focus on health insurance, positions it well for long-term growth. In a deal aimed at giving patients better access to diagnostic innovations and to reduce costs, the company this week acquired the clinical laboratory business of Boyce & Bynum. Complementing the growth initiatives, the management recently signed partnerships with leading retailers like Walmart (WMT) to provide multiple choices to patients while availing diagnostic services. Nearly half of the company’s projected revenue growth – in low- to mid-single digits – is expected to come from acquisitions this year and beyond, driving strong earnings growth during that period. Quest’s main competitor Laboratory Corporation Of America Holdings (LH) reported a sharp fall in earnings to $1.56 per share for the most recent quarter, despite revenues growing 1.8% to $2.79 billion. Shares of Quest have been on a free fall since mid-2018, after reaching a new peak. The downtrend continued in 2019 and the stock has lost about 16% so far this year.